Paleo sandwich bread, gluten-free sandwich bread, whatever you want to call it this grain-free bread is made in the blender and perfect for toasting, grilling, and making sandwiches. ﻿ Coming up with healthy meal ideas for a grain-free/gluten-free/dairy-free household can be challenging -especially at lunchtime! And most often, everyone is missing their favorite lunchtime meal: a sandwich! With this easy to make grain-free bread that is made in the blender, you won’t have to pay $6 to $8 for a single loaf of bread! 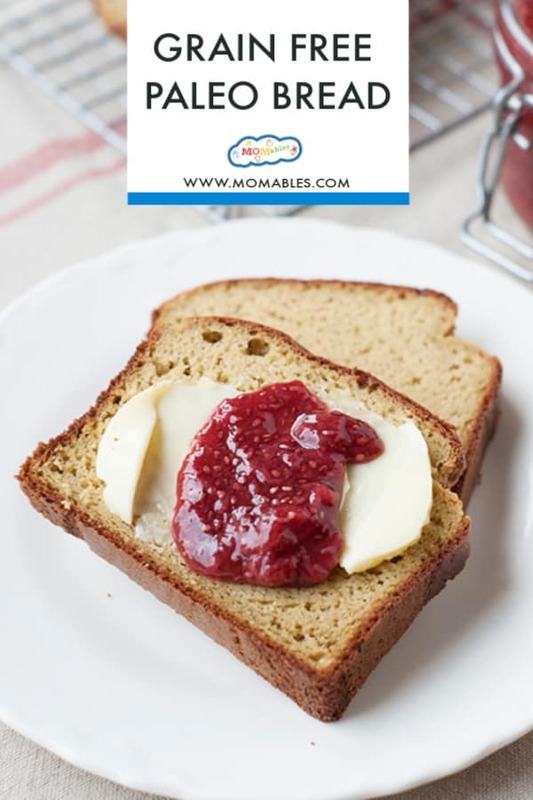 And this grain-free bread lets you make sandwiches, morning toasts, and even grilled cheese! If you want more delicious ideas for grain free meals check out the Grain-Free Family Meals Cookbook here. What Goes In Grain Free Bread? Nut flour or nuts and eggs are the essential grain-free ingredients. For this Grain Free Blender Bread, I use whole cashews and coconut flour to fill what would normally be used as regular flour or the “grains”. Blender bread is one of the easiest bread recipes you’ll ever make. No yeast, kneading, or bread makers required. Everything is combined in a blender, poured into the loaf pan, and baked to perfection. Since this recipe calls for whole cashews you’ll need a high power blender or food processor to get the batter just right. The batter should be smooth and pour easily into the loaf pan. 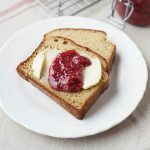 You’ll notice this recipe calls for 5 eggs which seems excessive but it’s key to a nice, tall loaf of grain-free bread, it also gives it a better texture. Another important recipe note is the type of loaf pan. You’ll want to use a 7 x 3-inch loaf pan, anything larger and your loaf will be a little flat, which is still usable but not ideal for sandwiches. This type of loaf pan is also a must for many grain-free bread recipes, otherwise, the cooking time will need to be adjusted. Can I make grain-free Bread Nut-Free? To make this grain-free paleo bread nut-free, simply swap the nuts in the recipe (cashews) with 2 cups of pumpkin or sunflower seeds and an additional tablespoon of coconut oil. The loaf color will be greenish but it will still taste amazing! Preheat oven 350F. Grease a 7×3 inch loaf pan. In a high-speed blender, place the eggs, cashews, coconut oil, coconut flour, baking soda, salt, and honey. Blend for about 45 seconds to 1 minute. until you have a smooth, thick batter. Add apple cider vinegar, blend to combine (about 10 seconds) and immediately transfer to the greased pan. Bake for 45 minutes. After 25 minutes, open the oven to cover with foil to prevent the top from burning. Continue to bake until a toothpick comes out clean when inserted in the middle. Remove from oven and cool prior to removing from pan. Store wrapped in the fridge for up to 5 days. • A 7 x 3-inch pan is a must, you’ll find the one I use here. If you make this in a traditional bread loaf pan the bread will be shorter and over-cooked at 45 minutes. • You can substitute sunflower seeds or pumpkin seeds for cashews but the bread will have a green tint. • Walnuts can be used in place of cashews but the loaf will be dark and very “earthy” tasting. For more ideas like these delivered straight to your inbox, check out our meal plans or get the free blog recipes by clicking here. Steak and grilled veggies sandwiched between melted cheese and toasted bread, that's melt-in-your-mouth good! Are honey and apple cider vinegar acting as rising agents here or just for taste? I’m trying to avoid sugar in all forms so I want to omit the honey but worry that without the honey, the apple cider vingar might make the bread taste rather sour. Please advice. They do not affect the taste. The chemical reaction is to give the bread rise and they are essential in the recipe. I have never seen a 7 x 3 inch pan. Is this just a tiny loaf pan? I’m having trouble finding one. I really want to try this recipe. Please tell me where to get one, thanks! Here you go Ariel! This is the pan I use. Great recipe! I didn’t have honey so I substituted maple syrup. It is a little sweet and is very tasty! I didn’t cover it with tin foil because it didn’t look very brown and fortunately it did not burn. This is my favorite bread recipe! Thank you! I would love to try this recipe, but do not have a food processor. I’m looking into options online. When you say high powered food processor, is there a certain wattage I should be looking for? Kristina, a blender works as well. This bread is amazing! I also prepared the recipe by using tapioca flour and a mixture od almonds and walnuts. My son was impressed by the texture and flavor of both breads. Thank you so much Laura! I’m SO GLAD! Thank you for trying it! Tere, do you just sub flour for flour and nut for nut, or is there another adjustment to make? Usually tapioca in a bread recipe is more of a main player rather than an addition. I am going to make this as written first but having an alternate recipe would help me out immensely if I don’t have cashews on hand. And we think I’m having issues with cashews so they may end up not working at all for me. Meghan, you can use walnuts or almonds work really well for this recipe. Tapioca is a starch, not a flour, and should not be used 1:1 here. Can I use one cup each of cashews and walnuts? I make a very similar bread that uses almond flour instead of cashews, otherwise the same. i double and bake in a glass 8×8 pan, comes out perfect size for 2 loaves, because I don’t have a 7 x 3 pan. I would be grateful if you would send me your complete bread recipe using the almond flour. That is the only nut that I can eat. Hi Glenda, you can use almonds in this recipe instead of cashews. Hi Laura, I am very exited to try this recipe for my daughter. Can I omit the cashews, or nuts, or seeds? Hi Nat, unfortunately, omitting the cashews, nuts, or seeds will omit the bulk of the bread. You need one of the three to form the dough. Sorry! Whatever you use to bake line it with parchment or a silicone mat. That should prevent leaching. Can you use butter instead of cocunut oil? Yes, it works with almonds very well. You get a nuttier (think whole wheat vs white bread) taste and texture. Enjoy! Loved this! I used a cup of raw cashews and a cup of raw sunflower seeds. The color was such bright dark green! Like moss. I used a square baking dish 5*5 or 6*6, not sure. Took all of 45 mins and turned out better than expected. The texture of the bread is like a cold pancake. Thanks for the recipe! It’s a keeper! I was wondering if part or all of the whole eggs could be replaced with egg whites in this recipe? Connie, I have not tried replacing the eggs in the recipe with egg whites. sorry! Would love to try to make this bread, however, don’t have a blender. If I grind the cashews in a small food processor first to make a flour, could i just mix all the ingredients by hand or hand mixer in a mixing bowl? You could definitely do that. Enjoy! Wow, wow how delicious this bread is! I live at night altitud and normally my breads turn uncooked in the middle, so with this recipe I used 4 eggs instead of 5, and walnuts instead of cashews….and voila! The best bread i have ever made! Thank you for this recipe! This is going to be my go to bread for dinners with friends and breakfasts… delicioso! Hi Laura, I was so excited to see this recipe as all the gluten and or grain free breads I have made so far haven’t been very nice. I made this straight away. Not sure what I did wrong but it doesn’t look like yours. It is as if the mix was too wet as it sunk in the middle and isn’t fluffy. Have you ever had this happen? Angela, did you use the right size pan? silly q’ I know, but the pan is the key to the success of this recipe. This recipe is amazing. Not normally one to leave comments but after trying several grain / dairy free breads, this is the best by far. My husband, who does not follow AIP diet even said this was great. Thank you! I am so glad you loved it! This recipe, and many others like it, are in my cookbook: The Best Grain-Free Family Meals on the Planet. After having lots of tummy problems over the summer and still not knowing what the exact problem is, I’m putting my family on a grain free diet. They’ll thank me later I know. I’m having trouble finding a 7×3 loaf pan. Can you help me? Hi Laurie! You can find a 7×3 loaf pan here. Enjoy! I may be late to the party, but I’ve been wanting to make this bread and can’t find a good pan. I see you have listed some, but I’m unable to click them. I’m not sure why. I find aluminum ones, but I’d prefer silicon if you could help. Thankyoooou!! I made this in a square-ish 1 squart baking dish. It rose high but this pan worked, and it cooked all the way through in less than 25 minutes (although my oven is unusually hot). I replaced the honey with 1 TBS cubed apples (which became applesauce in the blender…), and used 1 3/4 cups dry roasted cashews + 1/4 cup sunflower seeds. Delicious! Hi.. Can I replace honey for maple syrup.. Absolutely. You can replace honey for maple syrup in this recipe. Enjoy! First off I want to thank you SO much for sharing this amazing concoction! I’ve tried several grain-free bread recipes and this one tops them all. I’ve made it with cashews and walnuts and it’s super delish either way! I personally favor the earthy flavor of walnuts more so I almost always use go that route when making it (SO good!) This is awesome and SUPER easy to make! I highly recommend it to anyone looking for an easy and delicious grain-free recipe. thanks for trying it and I’m glad you enjoyed it! I made this bread using a glass meatloaf pan. It turned out GREAT! This bread is absolutely delicious! I slice it into 16 thinner slices. they toast great. I made the bread today and OMG it’s insanely delicious! The whole house smelled like fresh bread and I’m doing all I cam to not eat the whole thing. My eat-everything husband loves it so I may have to give the whole thing to him to eat. No way am I going to be able to control myself. I also loved that it was so easy to make, the prep was like 10 minutes and then into the oven. Thanks for this wonderful, grain free bread. This tasted amazing! Just wondering- should it have a spongy, moist texture? It was good as was- just wanted to make sure I cooked it correctly. Thank you so much for this recipe! Yes, due to it being grain-free, it will be a bit spongy. Glad you liked it! Should the cashews be raw or roasted? Hi, can I use a food processor such as magimix, for this recipe? You can try! Just make sure the mixture is completely smooth. I LOVE this recipe! It’s been heaven-sent in my house! The bread loaf looks wonderful! Could I use my new muffin top pan to make sanwitch buns? Bettie, I’ve never tried this recipe using muffin top pans. Please let me know how they turn out if you do! Would almond meal work in place of the cashews ? If I use it, how much do you think I would need? Thanks! Kelly, this recipe is only measured with whole nuts. You can use almonds. thank you for this recipe: it looks delicious! 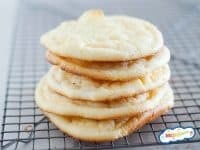 Can I substitute coconut flour with almond flour? Hi Adriana! Unfortunately you cannot substitute anything for coconut flour, as it requires much more liquid than any other flour. It’s very nutritious if you could get your hands on some! I used gluten free flour and it turned out delicious! Hi Jamie! If you use a standard 9×5 pan, the bread will not rise and will overcook. Here’s an inexpensive 7×3 pan! I made this and it is wonderful!! I made a few substitutions though. I thought I’d list them for those that may have similar questions. I used chickpea flour at the ratios suggested. *Instead of coconut oil I used olive oil. *I also didn’t have cashews or the suggested walnut substitution. Also, I have to admit that the idea of green bread had me a little excited so, I used sunflower seeds. *Last I used agave instead of honey for no other reason than because my three year old handed that to me instead of the honey. ***I just wish I had a better camera because the colour looks more blue than green in the picture but, it really is green! Thanks so much for all the tips! Green bread is kind of funny. I’m glad it turned out well for you! So excited to try this recipe! Forgive me for being clueless about baking, but can another sweetener, such as liquid stevia, be used in place of the honey? I wasn’t sure if it called for honey as a sweetener only, or if there is a necessary chemical reaction created with the honey. Trying to keep the carb count down. Thanks! Hi Sara! Liquid stevia is a lot sweeter in only a small amount, so you will probably just need a few drops. Adjust to your taste! I hope you love the bread. What stores carry these pans? Hey Pamela, this one should work! I went ot get some cashews from the supermarket and 2C cost $20……… kind of an expensive loaf of bread then, no?!! I order cashews online, in bulk, at $3.99-$5.99lb. You can also use walnuts for this recipe. Just tried this recipe – it is AWESOME!!! Would love to have detail on calories, protein, fat, fiber, etc. Is that info available? Thanks so much!!! You can plug any of our recipes into a recipe calculator. Enjoy! Hi I went to boy the WellBake Small Loaf Pan on Amazon , they have had it Currently unavailable for a while now. I was wondering if the recipe could be doubled and put in the larger loaf pan to cook? Its a 2 lb loaf pan. I have put off switching to the Nonstick Silicone Bakeware for a while now. But with Christmas its on my shopping list. This recipe will not work doubled and in a larger pan. Don’t waste your ingredients. I have an aluminum pan that I line with parchment paper. The small 7X3 pan is crucial for this recipe. Sorry! 8×3 7/8.so almost 8×4…..they are the disposable aluminum ones. ..they worked perfectly. ..I didn’t care if they didn’t. ….didn’t care the shape. .just wanted bread…but they are perfect little slices of mini bread….perfect because I usually eat a half sandwich anyway! !!! So 8×3 7/8… 8×4….WORKS. ..YEAH!!! I’m glad it worked out for you, Terri! I actually had success finding the 7×3 pans at Target, but they were paper so once and done. However they worked well enough for some time until mine came in. Great! thank you for sharing the resource! Is there any possibility that the next time you make this, you can measure your eggs into a measuring cup, and let me know how much of a cup it is? We have our own hens, including bantams that lay small eggs. So, I always have to estimate eggs. Thanks, I’m really looking forward to trying the bread. Aimee, it’s about 1 cup (a little under). Ok, Help. Does this bread rise at all. My bread was about an 1.5 inch high. I used a glass pyrex bread pan. Its about 7 inches long. Morgan, if you used a traditional pan, this bread will not come out. You must use the bread pan specified in the recipe. There are no 7×4 inch pans in glass available. They only come in aluminum and silicone. Yes, the bread rises but you have to use the pan in the recipe. Hi, I was wondering what you do when its to thick. I blended it in my vitamix. ( My vitamix likes to be difficult) I had to remove lid several time to mix with a spoon. It stopped mixing in blender since it was so thick, Yet I still had a chunky mix. I did measure very accurate. I was wondering if you do double or triple batches in a food processer? Morgan, the vitamix will work fine in this recipe. Use the plunger as you mix. It will take about 1+ minute of continuous blending. The batter is thick. I also had problems with my vitamix. The batter was thick and unmoving. Plus I felt like a lot of batter was wasted in the blender because it was too thick to pour out so I did my best to scoop it out from around the blades. Is there any way to add more liquid to fix these two problems? Megan, add all your liquids at the bottom first, then the dry ingredients on the top. Use a spatula to scrape the sides well. You can use a food processor too. I wouldn’t add more than 1-2 tablespoons of any liquid. it will change the recipe significantly. Hi, my son is grain free and egg free. Is there a way to make this bread as egg free? Possibly substituting 2 flax eggs and applesauce for the rest of eggs needed for recipe??? I have not tried this recipe egg free. Sorry! I am very excited about this recipe! Does it have yeast in it?? Thank you! Please click on the members link to access the recipe. No yeast.